Depending on the size and type of organisation (see below) nominated staff at your workplace will need to be trained in either 'Emergency First Aid at Work' or 'First Aid at Work' training course. 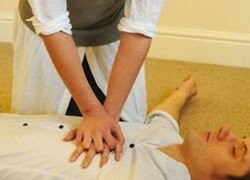 Both these first aid courses enable first aiders to carry out first aid duties in the event of a workplace accident. Which First Aid Course Should I Choose?